DOWNLOAD FINAL AGENDA HERE !!! DOWNLOAD AMoRE MEETING PICTURES HERE !!! 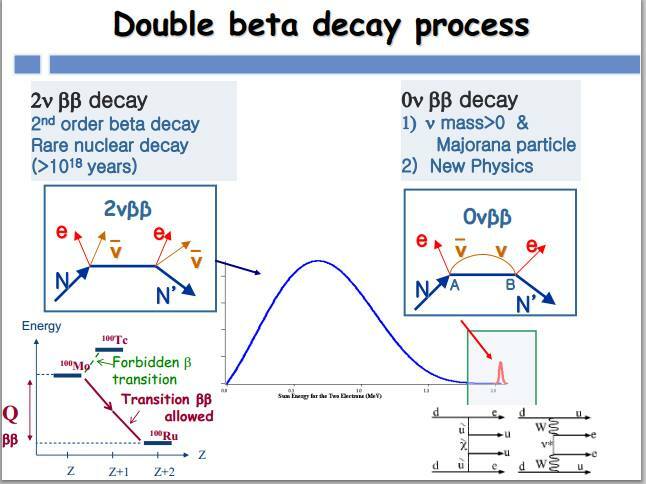 Why are we interested in neutrinoless double beta decay? The recent discovery of neutrino oscillations clearly indicates that neutrinos do have mass, which is compelling evidence of physics beyond the standard model of particle physics. However, while those observations provide information about the differences in the neutrino masses, they do not provide a direct measurement of the absolute mass scale and they leave un-answered questions about the properties of neutrinos. 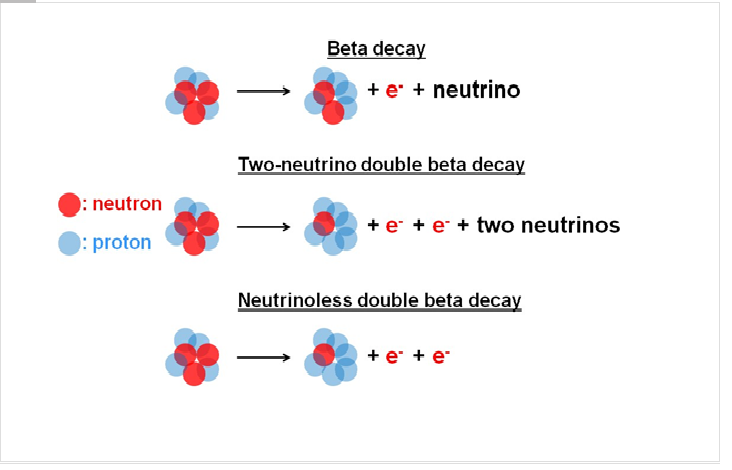 To answer to those questions, the AMoRE experiment will explore one of the most sensitive searches for "neutrinoless double beta decay" in which only two electrons are emerged from the nuclear-beta decays. If this decay were observed, it would be a clear signal that neutrinos have a different mass structure than other elementary particles and would provide a measurement of the absolute neutrino mass scale. What is the AMoRE experiment? The AMoRE experiment is an international collaboration with about 90 collaborators from 16 institutions in 7 countries, China, Germany, Korea, Pakistan, Russia, Thailand and Ukraine. This experiment aims to search for the extremely rare process of neutrinoless double beta decay of 100Mo isotope using 40Ca100MoO4 crystal in a deep underground laboratory to minimize possible cosmic-ray backgrounds. The decays are observed by detecting tiny amounts of heat (phonons) and scintillation light (photons) emitted by the crystal in response to the energy of the emitted electrons. Among molybdenum-containing crystals, the CaMoO4 crystal shows the brightest scintillation light at room and cryogenic temperatures. 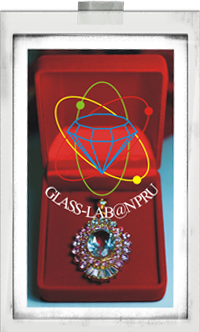 The 6th International Workshop on Double Beta Decay Search (11th AMoRE collaboration meeting) will be organized by Center of Excellence in Glass Technology and Materials Science (CEGM), Nakhon Pathom Rajabhat University (NPRU), Thailand. This workshop is also co-organized by Department of Physics Suan Sunandha Rajabhat University University (SSRU), Thailand. The AMoRE collaboration meeting will be held at Garden Cliff Resort and Spa Pattaya, Thailand. The Garden Cliff Resort and Spa Pattaya is 5 Stars Luxury Beach Resort, which located in North Pattaya. The resort provides privacy and tranquility whilst offering easy to the main entertainment and shopping areas which are just a few minutes away. With its own beach front the resort has 230 rooms, Stylish restaurants serve the finest Thai and International cuisine as well as delicious bakery treats. The spacious infinity pool overlooks the golden sands of secluded Crescent Moon Beach, directly accessible from the resort. !!! Please send your registration form to us before 10 January 2016 !!!. After that we can not garantee room in the hotel for you. If invitation latter for visa is needed. Please send email to us before 27 December 2015, we will provide official invitation letter from university and send to you in the 2nd week of January 2016. We would like to know your name in English (same with in passport) and your possport number to provide official inviataion letter for visa. In case of invitation letter just for your travel (not for request visa). We can provide for you in 3 days and send back to you by email. Please send your name to us. Pattaya is 147 kilometers southeast of Bangkok, facing the Gulf of Thailand. It is Asia's premier beach destination attracting families, couples and single visitors. Pattaya's relaxing tropical ambience offers every ingredient for memorable holidays. Accommodation ranges from luxurious hotels with superb convention facilities to simple guesthouses. There is a plenty of sporting opportunities both on land and water including golfing, game fishing and scuba-diving. Theme and amusement parks, offbeat museums and botanical gardens offer a variety of leisure activities and entertainment for all family members. We have 2 airports in Bangkok. Don Muang Airport (DMK) and Suvarnabhumi airport (BKK). Most of international flight will come to Suvarnabhumi airport (BKK). 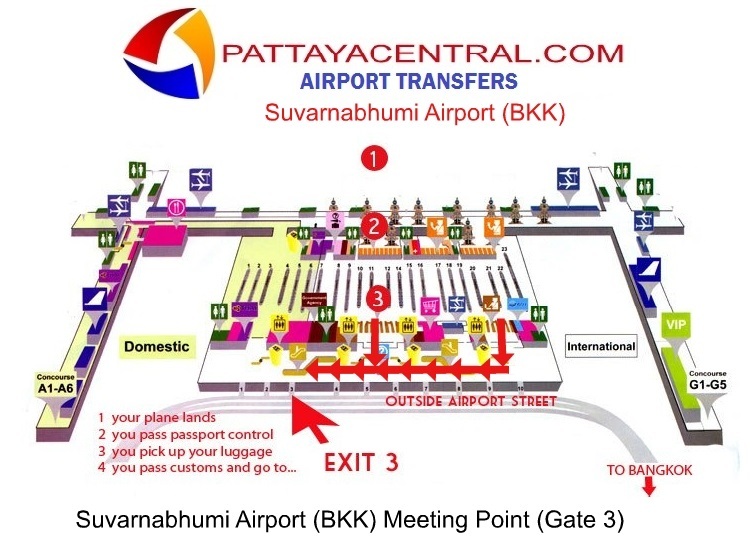 Please be sure that your flight will come to Suvarnabhumi airport (BKK). We will wait you at meeting point (near exit No.3). After passed custom declaration, please turn right and walk along the way. You will meet the meeting point. Please contact taxi service if you will not travel with us. Pattaya is very popular sightseeing place, big city and many style of people. Night travel alone in red zone area of Pattaya beach should be careful. There are a lot of money exchange counter at Suvarnabhumi airport. The best rate is Super Rich International Exchange, located at the ground floor of Suvarnabhumi airport (near airport rail link Suvarnabhumi station). Opening time : Daily : Monday - Sunday 09.00 am - 10.00 pm. There is connection (Wi-Fi) in hotel but not free. However, Organizer will be arrange Wi-Fi in meeting room. You also can use your labtop for presentation. There are mobile phone company counters at airport in arrival floor. You can buy Thai simcard and use with your phone. However, some system cannot use Thai simcard. Please ask the counter for checking your phone before buy simcard. We will provide Thai style food for you. If the participant request special meal (for example, Muslim food or vegetarian), please inform us.